"காக்கைக்கும் தன் குஞ்சு பொன் குஞ்சு" - “Even a crow thinks its child is golden”. This proverb out of ancient India applies particularly well to privatisations. To the parent it is simply obvious their child is a treasure. While others may notice the mite’s behaviour and odour with dismay, the parent focuses on precisely the same antics and bouquet with delight. "quod ali cibus est aliis fuat acre venenum" - "One man's meat is another man's poison". 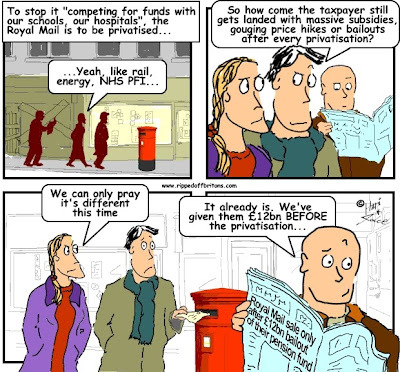 Those debating the privatisation of public services – be it outsourcing of schools, hospitals and prisons, or the privatisation of Royal Mail - sniff precisely the same thing. What stinks to one smells sweet to the other. Make no mistake, successful private companies bring success to their managers and shareholders regardless of the impact on everyone else. The “invisible hand” of Adam Smith (patron saint of capitalism, who like most saints is doubtless aghast at what is done in his name) that is said to push better services to customers is not benevolent. That mystical hand is directed by the selfish pursuit of profit. Ineptly regulated banks, energy companies, and the transport industry have all fulsomely proved that the quickest route to profit is the rip-off. The irony is the decision to privatise public services, yay or nay, is made by politicians elected by us ripped-off Britons. Politicians spout their soundbites, one way or the other with equal sincerity (i.e. very little). The question for us voters is not whether privatisation brings overall benefits or dis-benefits. The question is who gets the upside, and who gets stuffed. While private companies act in their own selfish interests, we ordinary citizens are asked to be more noble. We get the advice Queen Victoria gave her daughter on how the princess should respond to her husband's less welcome advances: "lie back and think of England". Being prone and selfless is a mistake even in capitalist terms. For the "invisible hand" to work, everyone must be selfish. Otherwise it is not the 'best' who wins the business, but the most selfish and ruthless and thus the 'worst'. So lets take a selfish look at two of the biggest privatisations from the point of view of we who elect the politicians who decide whether to privatise. "The restructuring of the CEGB involved dividing it into four successor companies on March 31, 1990—three of which were soon sold to the general public—creating a power pool, and liberalizing entry into the generation market. The three privatized companies are National Power and PowerGen, which took the thermal generating plant, and National Grid, which was allocated the high-voltage transmission network. Nuclear Electric took the nuclear power stations." Renegotiating the price of imported electricity from France. (As part of privatisation Britain got a worse deal in the price paid to Electricité de France (EdF)). Moving from expensive coal to cheaper gas fired power stations. The net effect of privatisation was a substantial improvement (reduction) in the cost of generating power. Yay! However, that improvement did not go to the consumers, but was taken as increased profits for the private companies and their shareholders. Boo! The report goes as far as to say the impact on customers buying the energy was very negative. "Rail fares are greater now, in real terms, than they were at the end of the 20th Century. In January 2013 fares across all operators are 23% higher than they were in January 1995. Prices have risen fastest amongst long distance operators. Regulated fares have been allowed to increase in real terms since 2004: Government policy for regulated fares has allowed for average increases of RPI+1% point. Passenger revenues have increased significantly since privatisation, and in 2012/13 totalled £7.7bn, roughly 150% greater, in real terms, than in 1994/95." According to the Office of Rail Regulation (ORR) everything about the railways has been steaming upwards for a decade except for one thing that has been falling like a lump of discarded coal: investment by the private sector train companies back into the industry. The extra cash went to the managers and shareholders of the private companies. 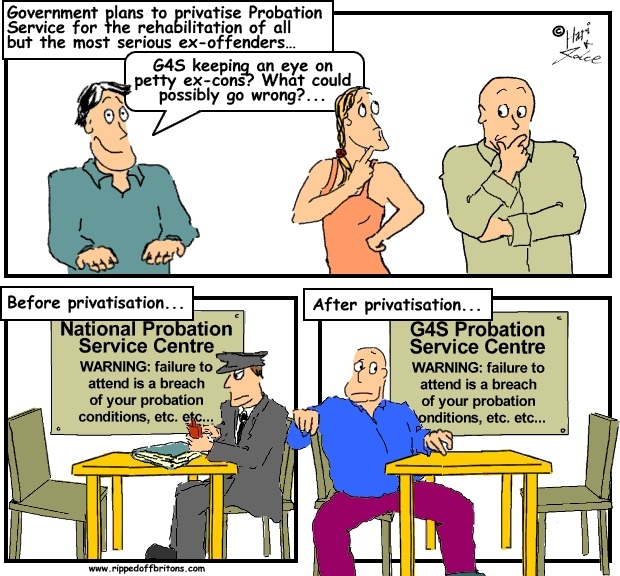 We have nothing against privatisation of public services when done to improve public services. Sadly private companies that put other people first tend to go bust. Which is why there are some things that need to be in the public sector. "The head of G4S has apologised to a committee of MPs for overcharging on contracts for tagging criminals. Chief executive Ashley Almanza told MPs the company failed to "tell the difference between right and wrong" when dealing with the contracts. " Report by the High Pay Centre: "Winners and Losers: the great privatisation game"
"The scale of benefits to the business leaders and investors raises doubts about the entire case for privatisations. Executives and investors exert huge influence over economic policy debate. As a profession, senior managers (in the private and public sector) benefit financially from the lucrative pay packages on offer in privatised companies, so it is no surprise that they use this influence to promote the sell-off of public assets, even though the benefits to the public are much less apparent."